Wow, it has been a while. I meant to get this posted before I left for Atlanta, along with a note explaining I would be gone for a week, but somehow with Alex’s multiple birthday celebrations it never happened. But anyway, I am home now and just as excited today as I was 2 weeks ago about this soup. So excited, in fact, that don’t be surprised to see a similar Mexican soup without seafood in the upcoming days. The tomato-onion-garlic puree that forms the base of this soup is a common theme in Mexican soups (see, for example, my tortilla soup), and I am realizing that I adore it in just about any form, not just the tortilla soup. Rick Bayless makes this with grilled shrimp on a skewer and grilled potatoes. I have no doubt that the presentation is lovely and striking, but at home this seemed like too much effort for me–not least of which because I still have not found a good home for my grill since my house rests on top of a small hill (a deck is tops on our list of things to do in the next, well, decade. So I roasted everything–on the same pan in fact. I roasted the potatoes and when they were basically done I made a space in the middle of the pan and roasted the shrimp there. I also marinated the shrimp with lime juice and added lime juice to the final dish, because I am one of those people who thinks a sour zing (citrus juice, vinegar, etc) makes everything better. The lime juice also makes it easier to coat the shrimp in ground ancho chile pepper. 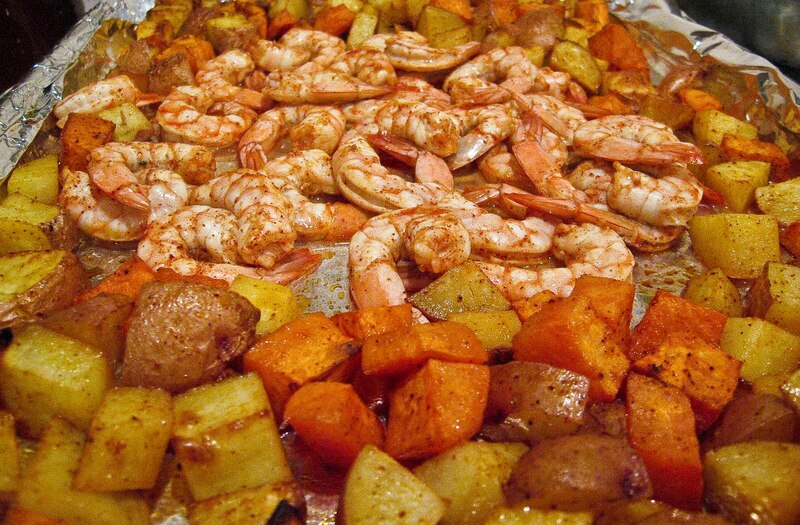 The broth can be made ahead but the shrimp and potatoes should be freshly roasted. 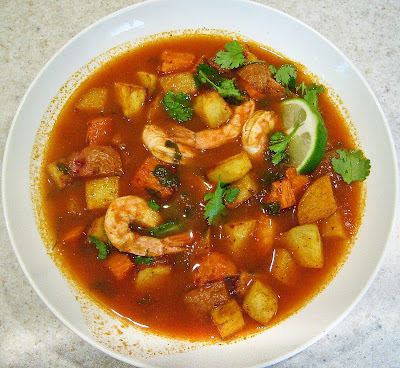 I made the broth for 2 nights but then made the shrimp and potatoes fresh each night, so that we had 2 nights of this soup. We could have eaten it for 3 nights even–we all loved it. Alex declared it the BEST soup I have EVER made! !–but she is prone to hyperbole as regular readers of this blog have probably guessed by now. 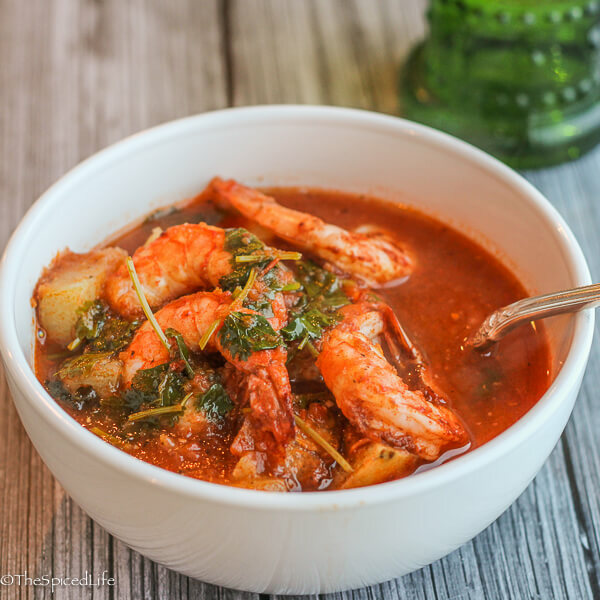 Added March 2015: we loved this soup so much that I made it again and updated the photos! 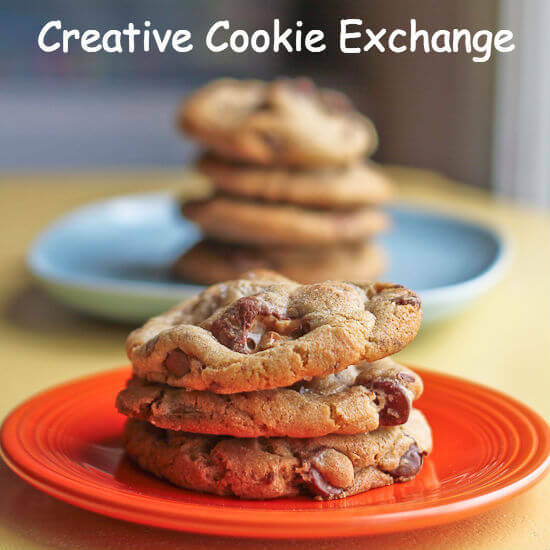 You can go read about it here if you want! Whisk together the juice of 3-4 limes and ancho chile powder. Toss the shrimp in this mixture, no more than an hour before serving, and place in the fridge. Preheat the oven to 450 F. While it is heating, toss the potatoes with oil and salt and and pepper. You can make the potatoes either before or after the broth because the longer the broth sits the more its flavor improves anyway, do whichever works better for your schedule. Place the potatoes in the oven and roast until tender and charred. In the meantime make the broth. Blend the onion, garlic and tomatoes in a blender until smooth. In a 4-6 quart pot, heat the oil over medium high heat. When it shimmers and is hot enough to make water sizzle, add the puree and stir constantly until the puree reduces to the thickness of tomato paste, 10-12 minutes (be prepared, you will get splattered). Stir in the stock and fresh herbs and reduce the heat to medium low, partially covering the pot. Simmer for 30 minutes. Before serving, add the juice of one lime and taste for salt. At this point the broth is made. In the meantime, when the potatoes are done but not too brown because they’ll be there another few minutes, stir them and make a hole in the center of the pan. Drain the shrimp of the extra lime juice and then place the shrimp on the pan (if you are cooking all 2 lbs of shrimp at once, which I did not, you might want to use a second pan, in which case oil it thoroughly–the potato pan should be greased enough). Roast until curved and almost but not quite opaque. 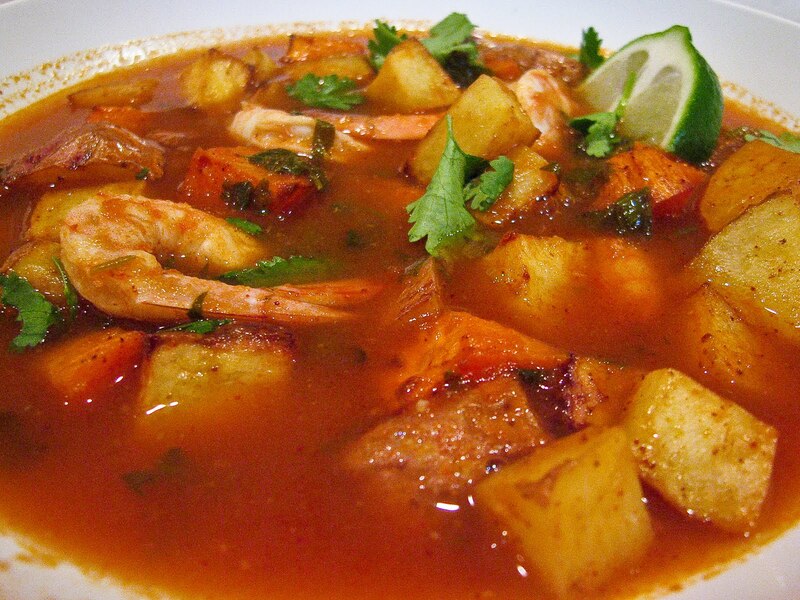 You want the shrimp slightly undercooked because they will cook further when the simmering broth is ladled over them. Place potatoes and shrimp in the bottom of each bowl. Ladle broth over it and garnish with some cilantro and a lime wedge. This soup looks sensational. Love all the different colors and flavorings. This sounds absolutely heart warming. I love the combo of potatoes and shrimps in this way. Sign me up! This soups looks delicious – look forward to seeing what you come up with in the coming days! I'd be excited about this too!!! This looks great. 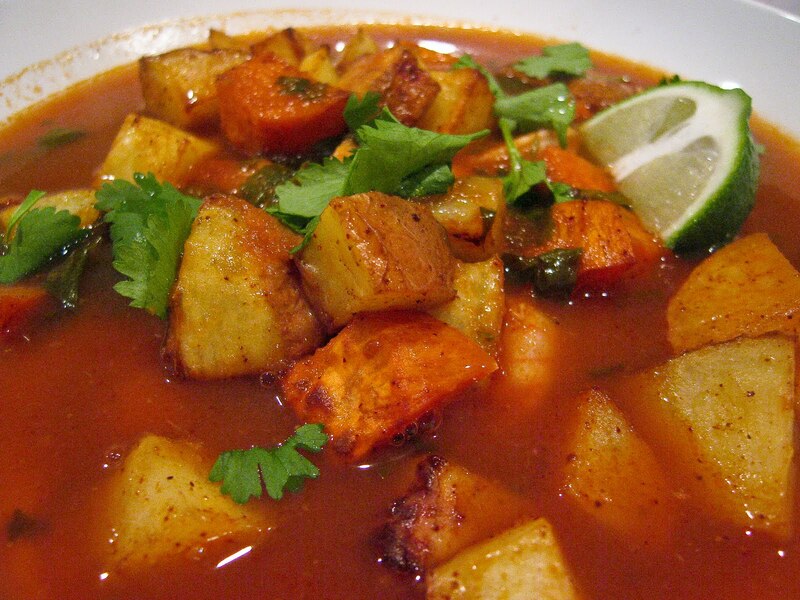 I love spicy, and I'm not sure I've ever tried a Mexican stew before. Thanks for the idea!